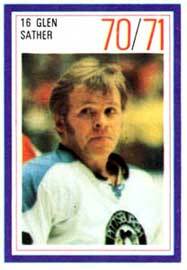 1976-77 O-Pee-Chee WHA card as captain of the Edmonton Oilers. A 1970-71 Glen Sather Esso Power Players stamp. 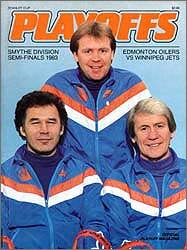 A 1986-87 Edmonton Oilers' yearbook. 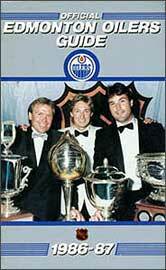 From left to right on the cover, Sather, Wayne Gretzky and Paul Coffey stand by the four trophies they individually won at the 1986 NHL Awards Ceremony. 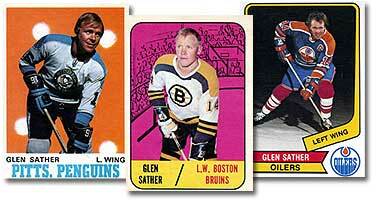 Glen Sather outfitted in an NHLPA jersey for his 1970-71 Dad's Cookies card. Sather (centre) and his coaching staff of Ted Green (left) and John Muckler (right) appear on this 1983 Smythe Division Stanley Cup semi-final playoff program. 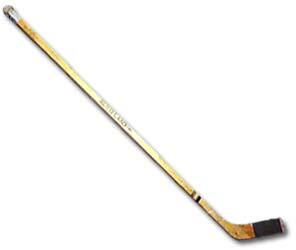 The stick used by Glen Sather as a member of the 1962 Memorial Cup Champion Edmonton Oil Kings.